Located in the south-eastern part of the Persian Gulf, Dubai is one of the most sought after city in the world with towering buildings, ultra modern hotels and luxury shopping malls. The city in itself boasts of grandeur and treasures some of the most renowned hotels and artificial islands. Amongst the luxury and wealth, lies a more adventurous side of the emirate. Yes the beaches and various activities lining the shore during daytime. Dubai is known for its clean and expansive beaches dotted with hotels and shacks. Innumerable tourists who love sports and the sea flock everyday to these beaches to soak in the cool blue waters as well as have a blast doing numerous adventure sports. One of them is parasailing. It is one of the most sought after water sport in Dubai. Parasailing is safe and fun. While parasailing one is attached to a boat and is buckled to a parachute. The parachute is lifted slowly as the boat gains speed. This is purely recreational and not professional. A typical ride lasts for about 15-20 mins and is generally 200 meters above ground level. The take off is generally swift from the flight deck and gains height with speed. The gust of cool wind mingled with the sight of the gulf city and the entire breathtaking panorama is an unforgettable experience. The sea below is yet another amazing view from a bird’s eye view and is truly is associated with a feeling of freedom. 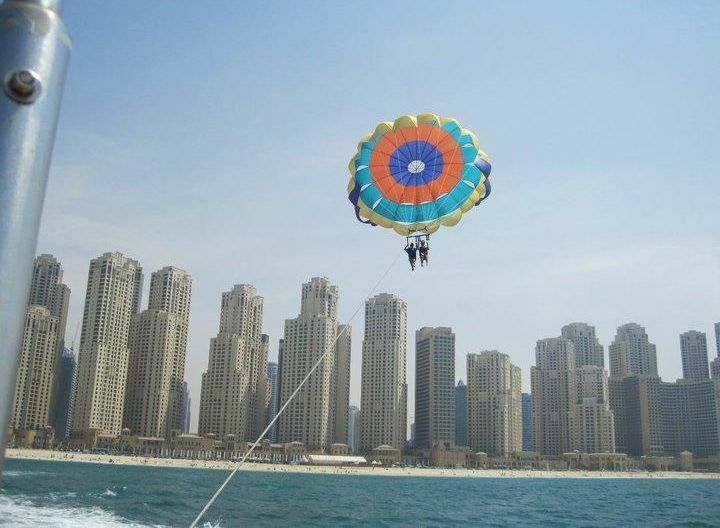 Typically the ride starts with a brief explanation of parasailing and its various procedures, followed by instructions on various equipments. Cancellation charges are applied as per policy. Generally full refund is made if cancellation is done 7 days prior to the booked date. Please click here to know more. Why wait? Fly like a huge kite, slicing through the cool wind above the sheet of water and beneath the vast expansive sky. Feel your adrenaline rush while you take off in a thrilling journey which offers glorious views of the entire emirate city of Dubai. Book now and indulge in a never experienced adventure of your lifetime. Click here for online booking or simply dial our number for inquiry. Our trained executives will shortly get in touch with you. Click here to call us.